The high performance heater, ECR, with an integrated thermostat and a heating capacity of 550 watts, uses a fan to distribute the heat generated evenly throughout the enclosure, which means hot spots can be prevented. Water condensation is eliminated, also when the ambient temperature drops sharply. The preinstalled integrated thermostat will save space inside the enclosure and reduce installation time compared with a thermostat mounted separately. High performance heater to prevent condensation. The fan assists the natural convection for a better heat distribution. Double insulated. Mounting clip for 35 mm DIN rail (EN60715). Temperature safety cut-out to protect against overtheating in case of fan failure, automatic reset. Thermostat control lamp. 0 °C to +60 °C. 2 pole clamp 2.5 mm², torque 0.8 Nm max. 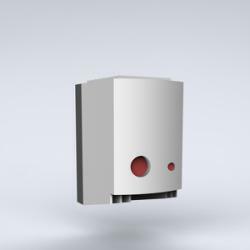 The large amount of heat generated by the optimised sized heater is distributed within the enclosure using forced air, produced by the heater's fan. Customers save installation time as the thermostat is integrated into the fan heater and therefore does not need to be connected. When installed, water condensation will be avoided especially in situations when the ambient temperature dramatically drops. As the air will be distributed by the integrated fan, hot spots within the enclosure will be prevented. Customer's labour costs are reduced due to not having to install a separate thermostat, which also saves vital space inside the enclosure.